This is the perfect place for a little ‘get away from it all’ time. The workshop mixes lots of nutrition & lifestyle information with an appreciation of the importance of nourishing the mind as well as the body. You will find yourself mixing with like minded people, sharing experiences (if you wish) and enjoying yourself! The emphasis is on empowering you to take charge of your own health, whatever your current health situation. Come on your own or bring a friend or relative, and know that you will be made to feel very welcome. And the best bit? A fabulous lunch is included! What evidence is there to support this stance? How do I handle controversies – meat? dairy? alcohol? organic? grains? Eat to OUTSMART Cancer is a workshop to give you information, but also to inspire you to a more conscious and enlightened path to health. Each class is led by Jenny Phillips, a Qualified Nutritionist, author & public speaker, who shares her own experience of surviving cancer through an integrative approach. 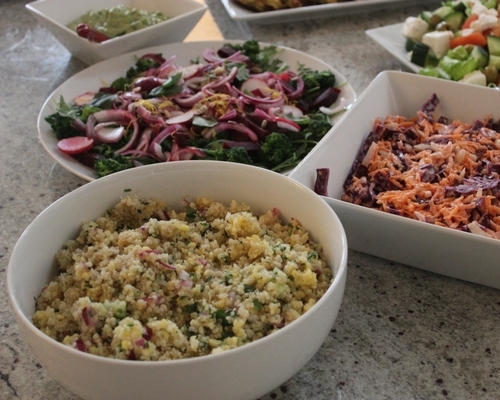 You will leave with a renewed vigor to embrace the healing power of food, and our daytime classes also include a delicious, colourful and healthy lunch. Please note: there may be some provision for those who are unable to pay and are currently going through a cancer journey, please email Jenny@InspiredNutrition.co.uk and we will see if it possible to help you.